Are you a Jack or Jill of all trades? Are you doing #allthethings and providing multiple services or packages to your clients? Are you confused about how you should address these various services or packages in your client contracts? If the answer is “oh my dear, YES,” then, you’ll want to listen to this episode of Office Talk. I’m answering these questions and more! Are you gearing up to launch a new product or service? Anne Samoilov, creator of Fearless Launching, shared so many amazing tips for a successful (and yet simple!) launch in this episode of Office Talk. In fact, even if you have no plans to launch anything right now, you still have to give this interview a listen. Anne’s tips are spot-on for any business owner to improve their ability to make decisions, plan, and execute effectively—in any area of their business, not just when it comes to launch time. It’s like we’re always launching, if you think about it. Every one of us has something we’re looking to get out into the world. Anne talks about how you can begin thinking with a launch mentality, not just for a successful launch, but also for a successful business. The best part? Anne likes to keep things simple, so all of her tips are attainable and will save you so much time—and maybe even your sanity! *** In the interest of full disclosure, if you purchase a product from Anne using the links above, I may receive a small commission. But trust that I only recommend people and products who I believe can truly make an impact in your business. Cause I've got your back, girl! Picasso was sitting in a Paris café when an admirer approached and asked if he would do a quick sketch on a paper napkin. Picasso politely agreed, swiftly executed the work, and handed back the napkin — but not before asking for a rather significant amount of money. The admirer was shocked: “How can you ask for so much? This struck such a chord with me because I meet a lot of entrepreneurs (me included) who have trouble valuing their work and time. How about you? Do you experience this in your business? Do you wonder if you’re asking for too much—or not enough—when it comes to pricing? Do you have a financial plan for your business, or are you getting caught up in the day-to-day of serving your clients or customers, to find out that all that effort is paying you peanuts? Do your eyes glaze over when you read about insurance policies? Of course they do! I haven’t met anyone for whom that’s not the case. Even Nikki Luby, who works in commercial insurance at Excelsure, admits that insurance isn’t the most interesting of subjects. It’s more a necessary evil. In this legal quickie episode, Nikki breaks down the basics of insurance and what you really need to help you cover your booty—without putting you to sleep with all the insurance jargon! Are you a social media influencer? Are you making waves on Instagram? Do you want to turn that digital content you’re creating into profits? Then you’ll want to listen to this episode with Ellie Altshuler, an entertainment and fashion attorney. In this Legal (not-so) Quickie episode, Ellie and I talk about our best tips for legally protecting your brand. Legal Quickie: Who Really Owns a Copyright When I'm Hired to Do Work for a Client? Legal Quickie: Someone Has Copied My Work. What Should I Do? Legal Quickie: Do I Need to File for a Trademark? Need help registering your copyrights or filing for a trademark? Contact me to inquire about these services. One of the biggest challenges I’ve heard from some of you is finding clients and closing sales. When I have a question about sales, my mind goes directly to Maria Bayer - a sales coach for creatives. So I invited her on the show to pick her sales brain for this episode of the Office Talk podcast. Drawing from her sales experience in Corporate America, Maria now coaches creatives on how to book clients quickly and for more money. And she’s sharing some of her top tips with us in this episode. Maria and I will be speaking at Be Sage Conference in December 2017. Join us! Legal Quickie: What Contracts Do I Need for My Business? One of the first investments you need to make when you’re running a business is a solid set of contracts. But which ones do you need and why? In this episode, I’m sharing with you the four essential contracts that business owners should have when running a business. I’ll explain what they are and why they matter. Do you have all of them? Listen to the episode to find out if you’ve got your booty covered! 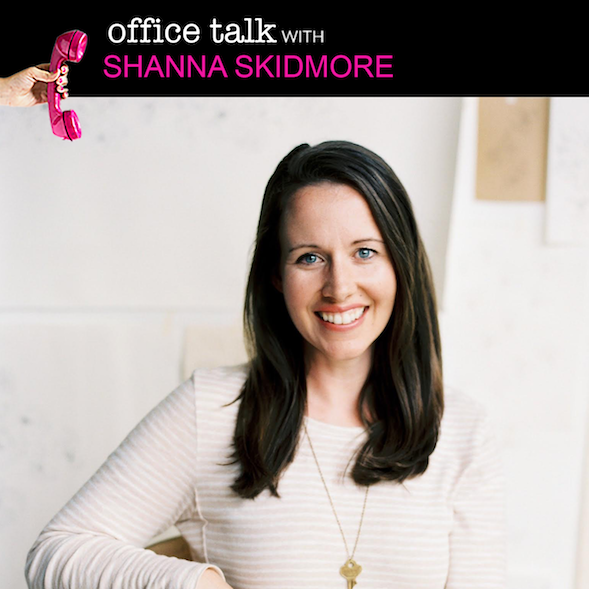 In this episode of Office Talk, I got a chance to chat with Shanna Skidmore, a business strategist and financial coach for creative entrepreneurs. I could definitely relate to Shanna, whose primary business goal is to simplify the seemingly daunting task of finance for her clients and set them up with the basic financial knowledge they need to take their businesses to the next level. For most creatives, finance and law can appear so overwhelming, but as Shanna shares with us, there are very few things you need to know, and once you know them, you’ll find it’s really not as complicated as you’d imagine. ** Heads up! Items marked with an asterisk are affiliate links. This means that if you purchase an item using this link, I may earn a commission. I only recommend products that I love. Wish you could pick the brain of a marketing magician who’s worn every hat imaginable? Amber Housley has so much wisdom to share with us from her vast experience, from her days selling personalized invitations on eBay (before Etsy was born) to a full-time career at a digital agency. She juggles family life with two kids and her current business as a marketing strategist for Lara Casey Media without missing a beat. Amber has seemingly seen and done it all, and she shares what she’s learned along the way in today’s podcast! In this episode of Office Talk, I’m talking to Heather Crabtree, founder of the Savvy Community about her own journey from law, to running her own event planning business, to what she does today - helping other female entrepreneurs build successful businesses. In this honest conversation, Heather reveals what her journey has really been like. Hint - it’s not always what it looks like from the outside.